These compressed Beetle sculptures are ace! 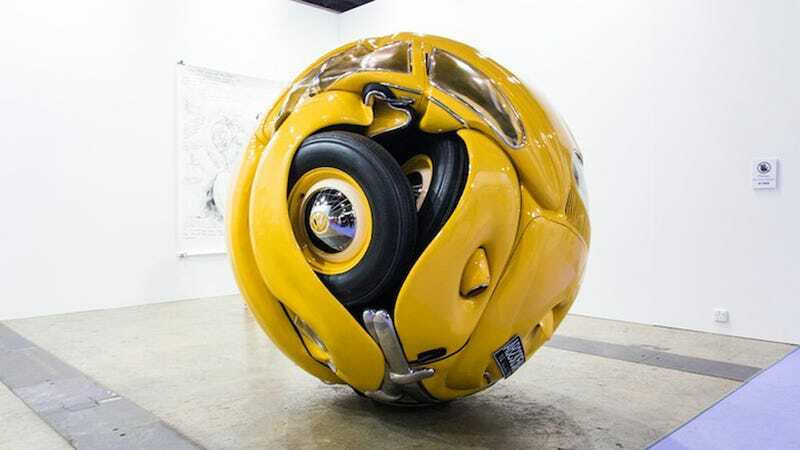 Beetle Sphere is a sculptural composite of five Volkswagen Beetles compressed into one spherical ball by Indonesian artist Ichwan Noor. The 180cm3 metallic orb, which was recently unveiled at Art Basel Hong Kong, is comprised of real parts from 1953 models of the car, combined with polyester and aluminum. The Jakarta-based sculptor, who is no stranger to working with such a large-scale medium (specifically automobiles), redefines the shape of a car with this piece and forces viewers to re-identify its purpose. Similarly, the artist has also reshaped cars into cubed figures.